Harman cuts the cable and makes Apple CarPlay work wirelessly | What Hi-Fi? Harman has developed a Bluetooth version of Apple CarPlay, so you'll no longer need to plug your phone into your dashboard. Soon you won't need to plug your iPhone into your in-car system to play tunes. That's because in-car hi-fi company Harman has developed a version of Apple CarPlay that works over Bluetooth instead of requiring a cable. CarPlay effectively puts your iPhone's operating system on your dashboard. Once synced, you can make calls, play tunes and view photos via the car's dashboard screen. It usually requires a Lightning cable, but not anymore. Once connected, data is beamed back and forth using wi-fi, which should make connecting as easy as getting on your home wireless network. It will also free up a USB port on the dashboard for charging another device. Harman is the first company to make CarPlay work over Bluetooth, but this step forward for in-car audio tech has been a long time coming. Apple first announced it would add wireless functionality to CarPlay back in 2015. 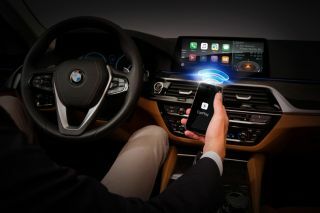 The 2017 BMW 5 Series is said to be one of the first cars to feature wireless CarPlay. Look out for it rolling out to other models soon.